Below are our 2018 NFL preseason predictions, including win totals, win-loss records, projected standings, playoff odds and Super Bowl win odds. We’ve included a few highlights, plus some tips on how to interpret the numbers. Editor’s Note: If you’re in an NFL pool or you’re betting games, check out our Football Pick’em Pool Picks, NFL Survivor Pool Picks, and NFL Betting Picks. As Sports Illustrated’s MMQB reported, statistics professor and sports analytics enthusiast Greg Michael Lopez (sorry Michael!) found our NFL preseason projections to be the most accurate system in both 2013 and 2014. Perhaps more importantly, our system was more accurate than Vegas preseason win totals in both years. Michael, who is now the Director Of Data And Analytics for the NFL, didn’t publish rankings for the 2015 through 2017 seasons. But we tracked our own results, and we’ve so far continued to beat the Vegas win totals. For team win totals where our projected win distributions indicated there was value on betting the Over or the Under, our picks went 43-37. During the season, we update these NFL predictions every day on our NFL projected standings page. How do we come up with these predictions? Exactly what do these numbers mean? Why does our approach make sense? #1 Seed Pick: New England Patriots (29.5%), with Pittsburgh Steelers (17.7%) the only other team over 10%. As we noted in our 2018 NFL preseason rankings blog post, we have identified a set of team-level metrics that have demonstrated predictive value for projecting a team’s upcoming season results. We identified these metrics by reviewing about a decade’s worth of NFL data and applying significance tests to any interesting looking findings. Then, we built an algorithmic model that takes in these metrics as inputs, and computes a numerical preseason power rating for all 32 NFL teams. A team’s preseason power rating signifies how good we think it will be this coming season. Figuring out precisely how many games we expect that team to win, however, is a much more complicated problem. To do that, we run thousands of game-by-game computer simulations of the 2018 NFL season, using our predictive ratings to come up with implied win odds for each game. Thanks to randomness, each season simulation plays out differently. Occasionally an unheralded team like the Redskins or Chargers gets lucky, makes a run and wins the Super Bowl. Over thousands of simulation runs, though, trends in the results begin to emerge. The 2018 NFL preseason predictions in this post represent the averages of all the season simulation runs we conducted. Exactly What Do These 2018 NFL Preseason Predictions Mean? It’s important to understand how our system generates the results it does, and precisely what they mean. We end up projecting a lot of fractional wins. That obviously can’t happen in real life. But we don’t want to reduce precision in the numbers just to make them look prettier. For example, a projected 9.6 win team has worse prospects than a projected 10.4 win team. If we rounded, they’d look the same (10 wins each). Even if we project a team with X wins, it doesn’t necessarily mean we’re highly confident they’ll end up with that exact number. Let’s say we project a team with exactly 8 wins. In our season simulations, 8 wins was probably the most common outcome. But that team may have ended up with 7 or 9 wins nearly as often. And it may have even hit 5 or 11 wins a good chunk of the time. Our final projection, since it’s an average of all those numbers, ends up at 8 wins — but the odds of the team ending up with exactly 8 wins could still be as low as 15%. 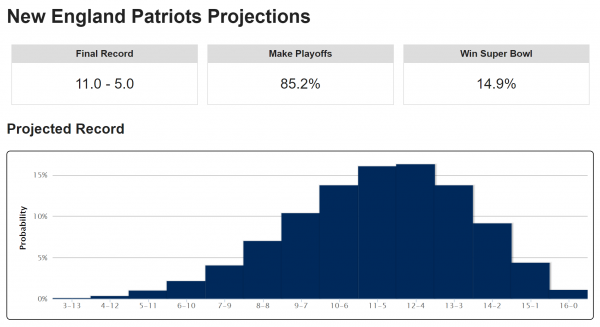 NFL predictions can change slightly day-to-day, even with no new game results. Because we re-simulate the season every day, randomness in simulation results may cause slight fluctuations in team projections from one day to the next, even if no new games have been played. So it’s wise not to read too much into tiny differences in the projections. A 0.1% difference in conference champion odds between two teams, for example, is not significant. Why Is A Simulation-Driven Approach Valuable? Despite some of the limitations, our data- and simulation-driven approach to making preseason predictions has proven to be a lot more accurate than the alternatives. Human NFL “experts” (some of them, at least) can be decent at projecting the future performance level of a team — especially one they’ve studied closely. But on the whole, they tend to have a very poor grasp of the potential impacts of probability and randomness over the course of a full NFL season. For example, even skilled “football people” tend to underestimate a great team’s odds of losing to a mediocre or bad team. While it’s true that a team like Pittsburgh is unlikely to lose to a team like Cleveland, upsets happen routinely in the NFL, and those probabilities keep adding up game after game. So you can’t discount them, especially when division championships can be decided by just one win. Running thousands of simulations to directly observe the distribution of outcomes generated by all the probabilities at play is a much more objective and precise way to do things. When the dust settles at the end of the season, our 2018 NFL preseason predictions will almost certainly be way off for a few teams. As happens every year, some teams simply defy expectations, while other projections will be derailed by injuries, suspensions and other unexpected events that occur as the season goes on. Our goal is the overall accuracy of the entire system, though — every prediction for every team. By that measure, our methodology has proven to be top-tier. If you’re in an NFL pool or you’re betting games this season, check out our Football Pick’em Pool Picks, NFL Survivor Pool Picks, and NFL Betting Picks.